A.M. in Psychology, The University of Michigan, U.S.A.
Ph.D. in Experimental Psychology, The University of Michigan, U.S.A.
Wichawut C. and Martin E. Selective stimulus encoding and overlearning in paired associate learning. Journal of Experimental Psychology, 1970, 3, 383-388. Wichawut C. and Martin E. Independence of A-B and A-C associations in retroaction. Journal of Verbal Learning and Verbal Behavior, 1971, 10,316-321. Wichawut C. Encoding variability and the effect of spacing of repettitions in Continuous recognition memory. Human Performance Center Technical Report, No. 35, The University of Michigan, An Arbor, Michigan, 1972. 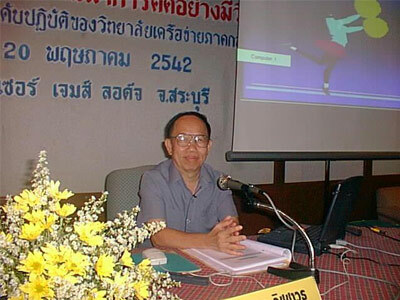 © Copyright Since 2001, Professor Dr. Chaiyaporn Wichawut. All rights reserved.